There have been many versions of the Schwinn tank. Each of them are distinctive and unique to certain models and years. Tanks tend to be one of the most desirable items for collectors since they significantly change the appearance of a bike. 2085 - B107 (Autocycle) Mens' with horn unit. Enameled. 8004 - 26" Mens tank for straight center tube frames. 8006 - Panther tank (men). Chromed trim. Also referred to as "curved bar". 2085 - D97XE Mens' with horn unit. Enameled. 9552A - B2E; D37XE; B2CXE; BB2CXE; - Womans' with horn unit. Enameled. 8008 - Spitfire Mens tank (less horn unit). 8048 - 24" boys Hornet tank. Also referred to as "Phantom" and "B-6". 2918 - B607 Deluxe Auto Cycle - Mens' tank with horn unit. Enameled. 8040 - 26" Mens' cantilever tank with horn unit. Enameled. Also referred to as "peanut" tank. 8046 - Tank for Panther II. Panther II - Panther III - 1961 Streamliner - Schwinn Peanut tank with horn (1959 Panther 2 decal shown). 59 001 - (8087F) Black with chrome trim. 59 060 - (8090F) Rose with chrome trim. With horn. 59 057 - (8090D) Rose with white trim. No horn. 59 031 (8005BK) Black Tank. As used on Hornet models. Plastic tank assembly complete with mounting hardware. Packed one per poly bag with header. 59 030 (8005Y) Yellow Tank. As used on Hornet models. Plastic tank assembly complete with mounting hardware. Packed one per poly bag with header. 59 025 (8005Y) Lightweight plastic tank that mounts to top bar on frame. Includes color trim on both sides. Comes complete with all mounting hardware.One per poly bag (12 per carton). 03 053 (9376) Hornet tank decal as used O.E. 03 250 - Scrambler tank decal. 03 251 - Tornado tank decal. 03 252 - Hornet logo tank decal. 03 253 - Hurricane 5 tank decal. 8077 - Horn and battery tray unit. The first cantilever type tank appeared in 1938 on the Schwinn Autocycle Deluxe and the last vintage cantilever tank was used on the Schwinn Jaguar mark IV in 1962. These tanks were used extensively for the next few decades until finally in the nineteen sixties they were only being used on the Jaguars, then after 1962 they stopped being used at all. The cantilever tank was however reintroduced in 1995 when Schwinn made a reproduction Black Phantom for their 100th anniversary. 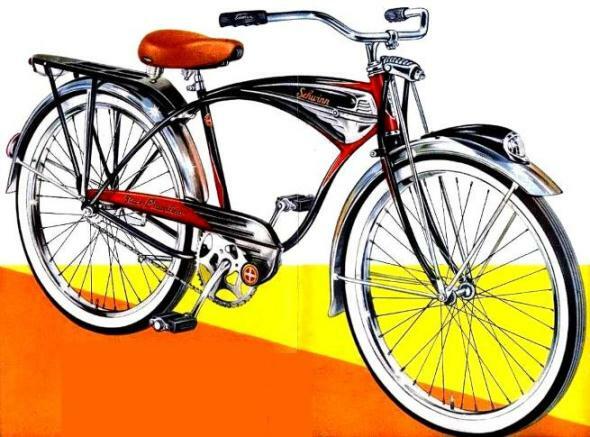 In 1959 Schwinn introduced the newest tank and called it the "trim line tank" in the 1959 Catalog. 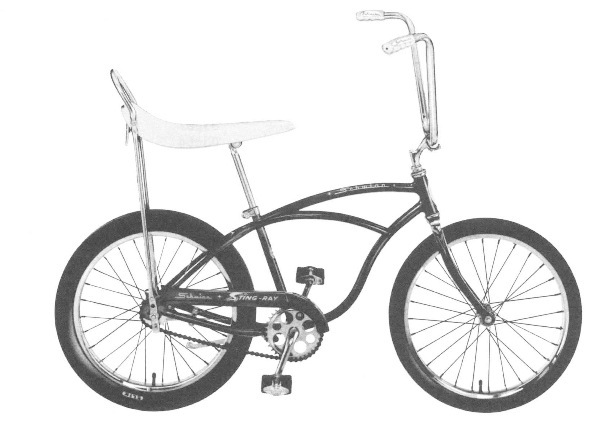 Schwinn bicycles began using slimline tanks in 1962. There were several different versions of the slimline tank as far as paint and decals go, but all used the same exact frame (there are two frame versions actually - one for men and one for women). 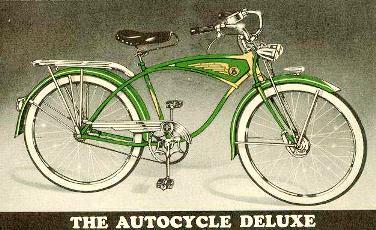 These tanks are well documented in the original dealer and consumer catalogs provided by Schwinn. In 1962 there were two bikes that had a slimline tank included. The American featured a slimline tank that had a chrome top and solid color bottom and included a horn and unique decals. The Fleet however, had a different paint job and did not include a horn, therefore there was no horn button hole on the tank. The top portion of tank was painted (not chrome) white, and the bottom portion was painted a solid color that matched the bikes' color. See the middle tank in picture or the top picture of this page to see this type of tank. In 1963 there were three models with slimline tanks. The Jaguar and the American now had the slimline tank with the chrome top and the solid color bottom, and the American tank lost its unique decals. On the Fleet models there was also a change in it's tank configuration. Now the "schwinn" was on the bottom portion of the tank, rather than the top. No horn, no chrome, "schwinn" on top as featured on the 1962 Fleet. Horn, chrome, unique decals, as featured on the 1962 American. Note: this tank body is the same as the later slimline tanks the only distinguishing mark is the additional American decal. No horn, no chrome, "schwinn" on bottom as featured on the 1963 Fleet. Horn, chrome, no unique decals, "schwinn" on bottom as featured on the 1963 American and Jaguar Mark V (and later the Panther). The rarest slimline tank is the 1962 Schwinn Fleet no horn configuration with the "Schwinn" on top. It was only made for one year. 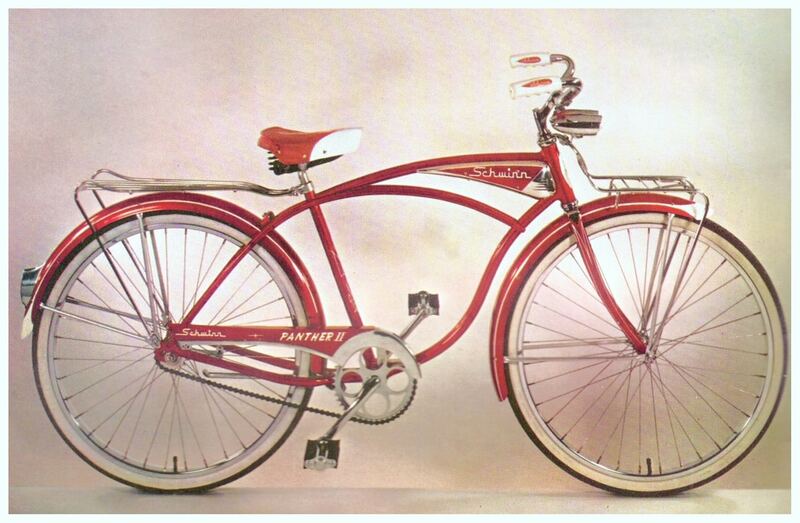 See complete Schwinn Jaguar history. Note: Not all slim line tanks came with horns. Early Fleet models did not have horns. This means that not every slimline tank will have a horn hole. The example pictures taken here are of a slimline tank with no details (paint or decals). The frame consist of two pieces - the left side and the right side. The exteriors of these pieces are shown above, to the left are the interiors of the pieces. There are frame mounts on the interior on one side is a small stabilizing tab and on the other are "U" shaped mounts which have the screw holes in them so that the tank is mountable. The exteriors were decorated different for different years and models. Some slimline tanks have a hole for the the horn button, some do not. A good tank is one that has a solid shape without major dings or dents. The horn uses a "D" cell battery. It makes an awkward noise in my opinion, but horns that work are an enviable detail for a restored bike to have. The screws are Phillips. the two that mount the frame are about an inch long. The screws that mount the horn to the frame are very short. I have made a video that shows how to take a tank apart and also features a working horn so you can hear what it sounds like.